Designed by Profonts Studio in . Published by Profonts. Laramie Pro is profonts script typeface family. The character set covers about 1,400 glyphs for the complete Latin character set (West, East, Baltic, Turkish, Romanian), and a huge number of handmade ligatures and stylistic alternates to make it a perfect OpenType Pro script. 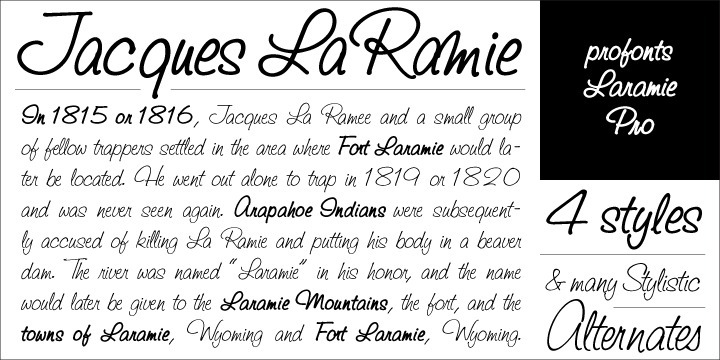 Laramie Pro is a very distinguished, modern and versatile script font. Laramie supports up to 73 different languages such as Spanish, English, Portuguese, German, French, Turkish, Italian, Polish, Kurdish (Latin), Romanian, Dutch, Hungarian, Czech, Kazakh (Latin), Serbian (Latin), Swedish, Croatian, Slovak, Finnish, Danish, Lithuanian, Latvian, Slovenian, Irish, Estonian, Basque, Icelandic, and Luxembourgian in Latin and other scripts. You can have an art experience in front of a Rembrandt… or in front of a piece of graphic design.